Executive Summary: Accuracy In Media’s “Mission Statement” proclaims that it is a “non-profit, grassroots citizens watchdog of the news media that critiques botched and bungled news stories and sets the record straight on important issues that have received slanted coverage.” So will AIM, or FAIR, or whoever, please critique the botched and bungled news stories about Taiwan’s 319 Shooting Incident? Will somebody please set the record straight on this important issue that has received slanted coverage in the US media? What can I say? I would have been perfectly content to let CNN’s botched and bungled news story slide, but CNN wouldn’t let me. They insisted on botching and bungling the same story again, one year later. Soon after last year’s 319 Shooting Incident, CNN posted a news photo of ROC president Chen Shui-bian standing in an open red Jeep, with a bright red blood stain on his beige windbreaker. Notice the red circle? That’s where Chen was shot and bleeding profusely. Or so we were told. 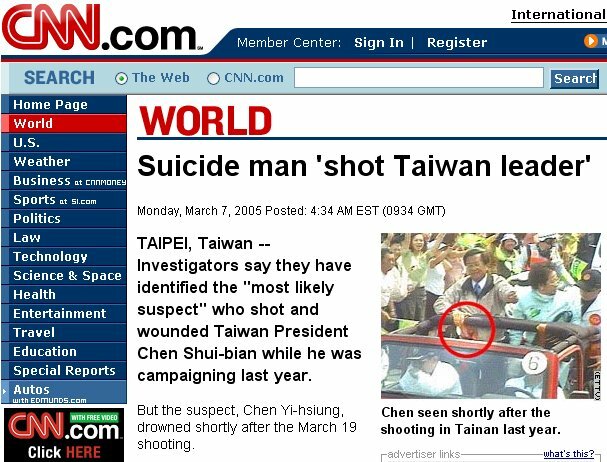 A year later, on March 7, 2005, in a story entitled “Suicide Man ‘shot Taiwan leader,'” CNN used the same photograph a second time. The only problem is, there was no blood stain on Chen’s jacket. There was no blood stain on Chen’s jacket because Chen was never shot. 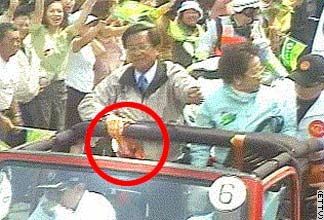 There was no blood stain on Chen’s jacket because there was no “assassination attempt,” by the KMT, the PFP, the CCP, or anybody else. There was no blood stain on Chen’s jacket because the 319 Shooting Incident was a “Wag the Dog” election charade scripted, directed, and performed by Chen himself. The “bright red blood stain” on Chen’s jacket was actually a bright orange nylon seat belt, attached to the Jeep’s roll bar, a shoulder harness to be exact. Scan along the roll bar to the driver’s side of the car to see the other, matching shoulder harness. The resolution of the CNN photograph is a little low, so if you’re still skeptical about the “blood stain,” that’s understandable. If that’s the case, take a look at this photograph of Chen’s Jeep, posted at the 319 Truth Commission’s official website, clearly showing the shoulder harness. 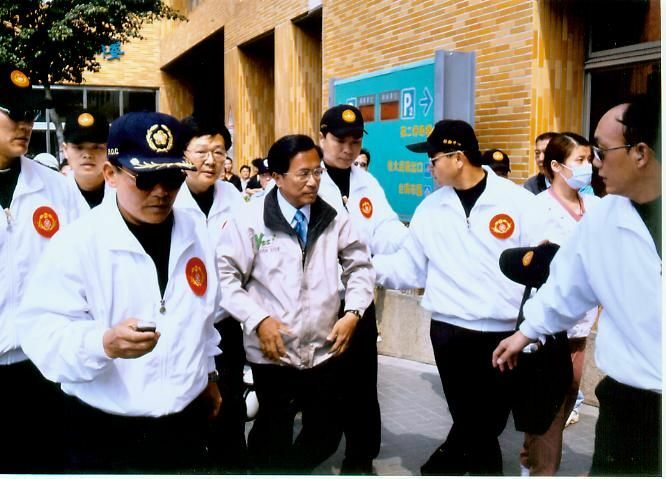 Finally, for the real clincher, take a look at this photograph of Chen being rushed into Chi Mei Hospital by his Praetorian Guard, also posted at the 319 Truth Commission’s website. Do you see any blood stains on his windbreaker? For that matter, do you see any bullet holes? Chen Shui-bian being rushed into Chi Mei Hospital. No bloodstains. No bullet holes. CNN and the US major media, were to put it bluntly, asleep at the switch. Is this the quality of journalism we can expect from our intrepid Fourth Estate? Forensic expert Henry Lee’s analysis of Chen’s white blood cell count indicates that the “gunshot wound,” or should we say, “surgical incision” on Chen’s abdomen was created well before Chen’s motorcade reached Jinghua Road. Chen Shui-bian desperately tried to prevent the formation of the 319 Truth Commission, the ROC counterpart to America’s Warren Commission. Chen didn’t give a damn about the “separation of powers.” Chen was frightened to death that any investigative body with sufficient legal authority would expose his Wag the Dog “assassination attempt” for what it was, a colossal hoax. When the 319 Truth Commision was eventually formed despite Chen’s veto and Pan Green obstructionism, Chen insisted that administration officials could invoke “di kang quan” or the “Right to Resist” in the event they were subpoened by the committee and asked to provide eyewitness testimony or physical evidence. I kid you not! The US major media have now had a entire year to get the 319 Bulletgate / 320 Election Fraud Scandal story straight. To give credit where credit is due, a March 7, 2005 New York Times article by Keith Bradsher entitled “Taiwan Police Say Who Shot President, but Suspect Is Dead” finally provides us with a little news that’s fit to print. 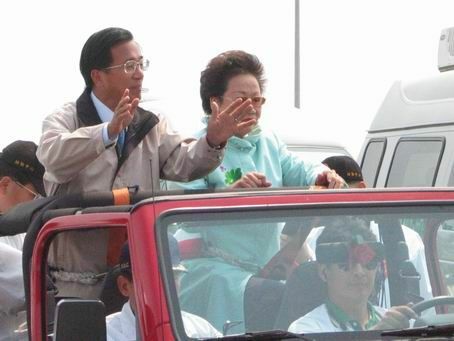 HONG KONG, Monday, March 7 – The Taiwan police announced late Monday morning that they had identified the man who shot and injured President Chen Shui-bian on the eve of national elections a year ago. But the police said the man had acted on his own and then drowned himself, fully clothed, in a harbor 10 days after the shooting, leaving no one to arrest. Spinning the sort of story once found in dime store novels, [emphasis added] the police said in Taipei that a middle-aged man had carried out the shooting on March 19 because he was depressed about difficulties in selling a house and blamed the president’s management of Taiwan’s struggling economy. The Chen regime’s feeble attempt to foist a dead man off on the public as the “assassin” is both laughable and ironic. One of the funnier political jokes making the rounds on Taiwan the past year has been that if the Chen regime ever “solves” the case, the culprit will almost certainly be a dead man, someone unable to deny the charges leveled against him and demand his day in court. Polls show that only 25% of the public believes the government’s fairy tale. That means even half the Pan Green camp doesn’t buy it. The Pan Blue opposition was caught off guard when Chen staged his Wag the Dog “assassination attempt” last March. Not this time. This time they saw the Chen regime coming a mile away.